Hand carved from soapstone this is serious cookware that rocks! Made in Brazil the unique ability of soapstone to hold heat for incredibly long durations make this cooking tool a must have for the wood fire oven. Wildwoods 12 inch griddle with channel is excellent for use in the wood fired oven. We like to set it directly on the hot coals till it is smoking hot,then sear steaks on it. The grooved channel collects fats and juices. Another benefit of the griddle is it is great for keeping pizza and horderves hot at the table. When placed over canned heat the stone griddle is fantastic for searing thin slices of vegetables and meats tableside. 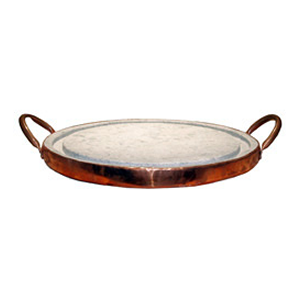 This Stone Griddle has all the benefits of our bakers tile, but with the added benefit of beautiful copper handles.